DMI Office Furniture Rue de Lyon Collection Executive Left L Desk is quality crafted with maple solids and American cherry veneers with select hardwood detailing. Desk and return each have a center drop-front drawer that can function as a conventional pencil drawer or a keyboard drawer. Each pedestal includes a felt-lined box drawer with pencil tray, box drawer with dividers, and file drawer. Middle box and file drawer secure via kneehole lock. File drawers are equipped to accommodate front-to-back letter sized or side-to-side legal sized hanging file folders. All drawers are fully extending. 4 levelers per pedestal. Cable grommet in each pedestal end. 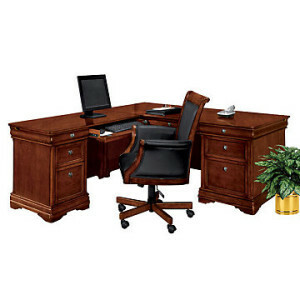 Desk measures 72″W x 36″D x 30″H. Return measures 48″W x 24″D x 30″H. Ships assembled, just attach return to desk.